It can be difficult to ascertain the exact age of a snapping turtle (Chelydra serpentina), particularly those of advanced age. You can count the growth rings of young individuals to get a reasonably accurate estimate of the animal’s age, but this method is less reliable with mature specimens. However, the turtle’s size and shell provide additional clues about its age, if not certainty. Inexperienced individuals should never handle a live snapping turtle, as they can inflict serious injuries. Growth rings form in much the same way that tree rings do: The individual scutes that combine to form the turtle’s shell grow rapidly when resources are plentiful, but they grow very little when they are scarce or physical demands are high. This alternating growth pattern forms visible rings around the scutes; because this pattern typically repeats on an annual cycle, each growth ring often corresponds to one year of life. Therefore, a turtle with seven growth rings is approximately 7 years old. However, research has demonstrated that growth ring counts are frequently incorrect, even in turtles as young as 4 years of age. Snapping turtles grow slowly. While animals from some populations mature in five to seven years, many females require more than a decade to reach maturity, and some females are nearly 20 years old by the time they deposit their first clutch of eggs. Growth rates are somewhat consistent among immature individuals within a given population, whereas the growth rates of adults vary widely. Some individuals appear to grow for an extended time after reaching maturity, whereas others appear to stop growing. It is likely that reproductive output, environmental variables and other factors play a role in these differences. Nevertheless, size is a reasonable criterion for inferring age, at least for casual purposes. In general, larger turtles are older than smaller turtles. 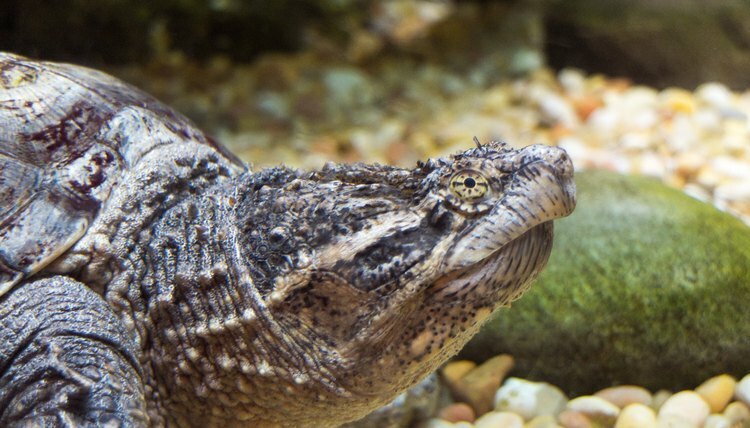 According to the Tortoise Trust, snapping turtles often reach about 7 inches in carapace length by the time they are 10 years old; by the time they are a quarter-century in age, they reach about 11 inches in carapace length. The largest specimens -- with carapace lengths reaching or exceeding 18 inches -- are likely 70 to 100 years of age. Because of the shorter growing season they experience in the wild, snapping turtles from northern latitudes tend to grow less in each year than their southern counterparts do. This means that for two specimens of identical sizes, the one hailing from the north is usually older. Hatchling turtles possess three distinct ridges down the length of their carapaces. Over time, these gradually disappear, and the shell becomes smooth across the top. While you cannot determine the exact age of a snapping turtle based on these ridges, it is reasonable to assume that any turtle who has a smooth carapace is at least a few years old. Some hatchlings bear small white dots on their shells, but these tend to disappear with age. In practice, this is only helpful for verifying that a turtle with such spots is rather young, though its size would communicate this fact. Although it does not provide an exact age, the extent to which a turtle’s shell has eroded can provide clues to its age. As a turtle crawls over rocks and logs, the abrasive action against the shell -- particularly the plastron -- will cause the shell to become “weathered” and smooth. Young turtles, who have not put their shells through this much wear and tear, tend to have shells that lack this polished look.